CHAPEL HILL, NC – Freehold Communities, the developer of Legacy at Jordan Lake, is pleased to announce that the community held three exciting recent events, Brunch at Legacy for area real estate brokers, Legacy Spring Celebration for the general public, and an entry in the Triangle Spring Green Home Tour. All three events were well attended, with more visits anticipated and encouraged throughout the spring and summer season. 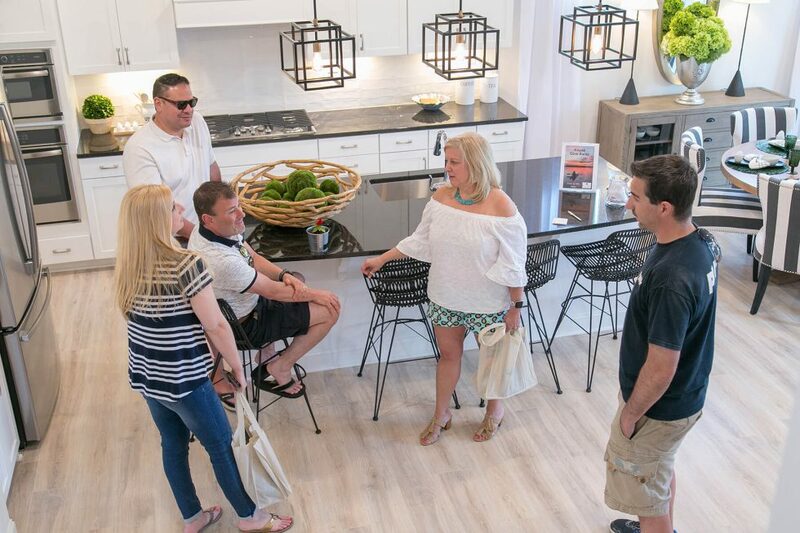 Triangle-area real estate brokers toured the new M/I Homes’ model home and the new Legacy at Jordan Lake clubhouse and amenity center during the Brunch at Legacy on April 10, 2018. With a theme of “Live Rich without spending a fortune,” brokers had an opportunity to get a sense of the elegant lifestyle offered this premier gated community via its exceptional homes and desirable amenities while noting that home pricing starts in just the upper $300s. On the beautiful afternoon of April 28, 2018, Legacy at Jordan Lake hosted the Legacy Spring Celebration with the Grand Opening of the Legacy Amenity Center, tours of the M/I model home, activities for children and families, music, giveaways, and free lunch by Chick-fil-A®. An open-air bus transported visitors throughout the neighborhood and a WRAL Live Remote provided music for dining and kid’s activities. Special thanks from Freehold Communities to one and all who attended this special event. Also on the weekends of April 28 – 29 and May 5 – 6, 2018, Legacy at Jordan Lake was home to an entry on the Triangle-wide Spring Green Home Tour. The Energy Star® 3.0 Certified model home by M/I Homes is on this year’s Green Tour, sponsored by the High Performance Building Council of the Home Builders Associations of Durham, Orange, & Chatham Counties and of Raleigh – Wake County. The 2,944 square foot home consisting of 5 bedrooms, 4 baths, and a 2-car garage includes numerous energy efficient features, such as TechShield Radiant barrier roof sheathing, insulated headers on exterior windows and doors, state-of-the-art Plex-A plumbing, low-flow faucets and shower heads, extensive use of local materials and local manufacturers, a raised heel truss system allowing for thicker insulation, and a 15-year transferable structural warranty. Located at 66 Legacy Club Drive in Chapel Hill, Legacy at Jordan Lake invites everyone to visit the model home and learn more about its green and energy efficient products. Construction is currently underway on single family M/I homes ranging from 2,000 to 3,000 square feet at Legacy at Jordan Lake’s Legacy Village. Located across from the amenity center, these homes are priced from the upper $300s. Single family M/I homes ranging from 3,000 to 3,500 square feet and priced from the low $400s in Legacy Falls South at Legacy at Jordan Lake will soon be underway. Call 919-337-9710 or email salesraleigh@mihomes.com to set an appointment to learn more about these new home opportunities.